Hello guys! Welcome back to another post, I hope you’re all doing well. If you’re anything like me and are OBSESSED with everything smelling delish – I suggest you read on! I have been enjoying making my flat (who I share with my boyfriend and our dog) feel extra homey and cosy recently, and obvs the cold weather calls for fluffy cushions, warm blankets and festive scents. I love a good old candle and a diffuser, and since owning my own place, I have become increasingly more obsessed with the way the place smells. Probs because I don’t want my place smelling of wet dog (or dead rats when he likes to rolls about). 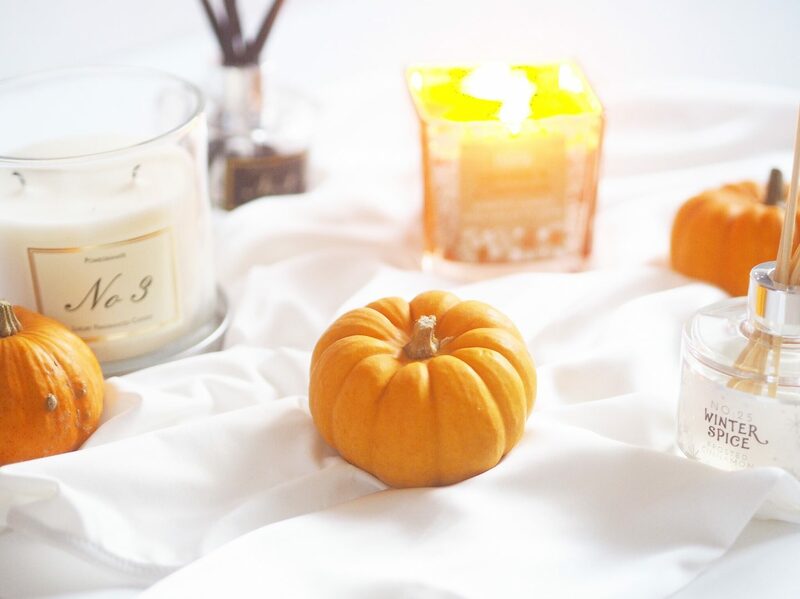 So basically, I have been picking up a few bargain diffusers and candles that I’m really enjoying recently so I wanted to share these with you! First of all, we’ll start with the Aldi candles (AKA Jo Malone dupes). Now, I’m gunna be straight up here, I don’t own any Jo Malone candles, or anything of that matter, because I simply can’t justify the price (although I’ve heard good things!). When I saw people hyping about the Aldi candles and them being similar to the Jo Malone ones, I wanted to get my hands on them. I can’t exactly comment on the similarity in terms of smell as I haven’t burned the other ones, but I love the simplistic style they’ve gone for with the packaging and the branding. I love the size of them, they are perfect to go in the living room and last agessssss. I have got all three of them and they all cost £3.99. I really like the smell of all them, but for me I prefer sweeter smells, so I think the most powerful is the Blackberry Bay. It smells heavenly, and is a perfect scent for this time of year! Next up is the Aldi Reed Diffuser…. As the reed diffusers were right by the candles, I decided to pick up one of these too. I picked this one up in the Pomegranate scent and it current sits in my bedroom and releases a really nice consistent smell. Again, the packaging is really sleek and simplistic and come in a 100ml glass container. These again come in the same scents and are also £3.99. I love having reed diffusers in the flat because it’s nice to know that when you’re not in and you come come from work you still have a nice smell lingering as obviously you can’t burn candles when you’re out! Keeping with diffusers, I also picked one up from Primark. I’ve been seeing a few people pic cup some good homeware bits from Primark especially the candles and reed diffusers. 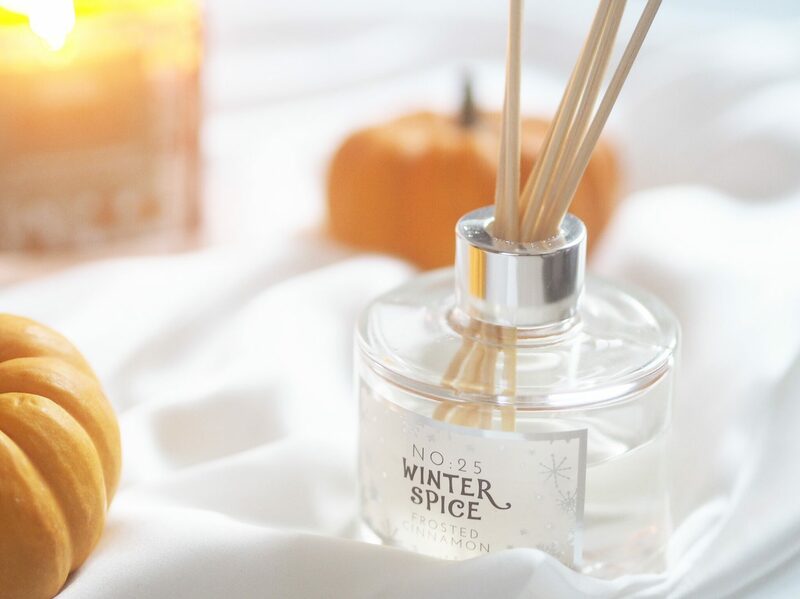 I saw this one last minute, and picked it up because I wanted a festive smell early (who doesn’t want a bit of cinnamon in October). The one I picked up was the Winter Spice Frosted Cinnamon. I’m not going to lie, it doesn’t really smell like like cinnamon as such, but it does smell really sweet and festive. This was only £3 and the smell really is quite substantial. When I go into my living room I can now smell the diffuser and It’s sooooo good. Some diffusers aren’t as strong and I don’t really see the point with it, but this one is really nice and I am loving it! Next up is probably my favourite. I have fallen in LOVE with this smell and I’m so happy it’s such a good price and can pick it up really easily as it’s from ASDA! This gorgeous candle is £2.50 and it is heavenly. There are a couple of scents to choose from and I remember there being a proper christmasy one which is red and one I am definitely buying but this one is the orange and cinnamon one and supposedly burns up to 30 hours! Also, can we just appreciate the gorgeous packaging for a supermarket candle and for £2.50 it just looks so good on the mantlepiece! I can’t wait to pick up some more of these festive candles. So there we have my current favourite home scents which come with bargain prices! You can’t really go wrong! 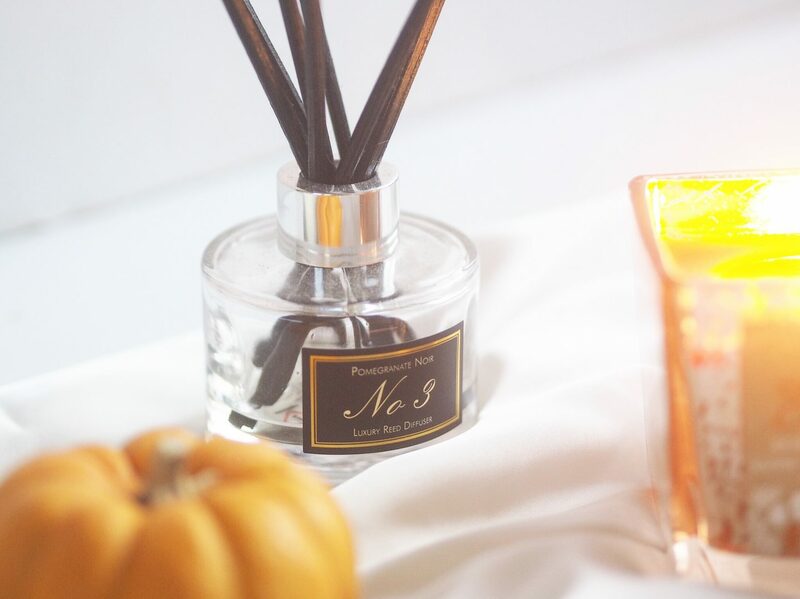 What are your favourite candles/ reed diffusers? I’d love to know other places to look! I LOVE a good candle but I usually don’t buy them coz everytime I love a scent of one it’s always too expensive! I’ve been on the hunt for some cheaper ones but the ones I want I can’t find anywhere near me! That one from ASDA sounds so nice though I might have to check that out. Lovely post! 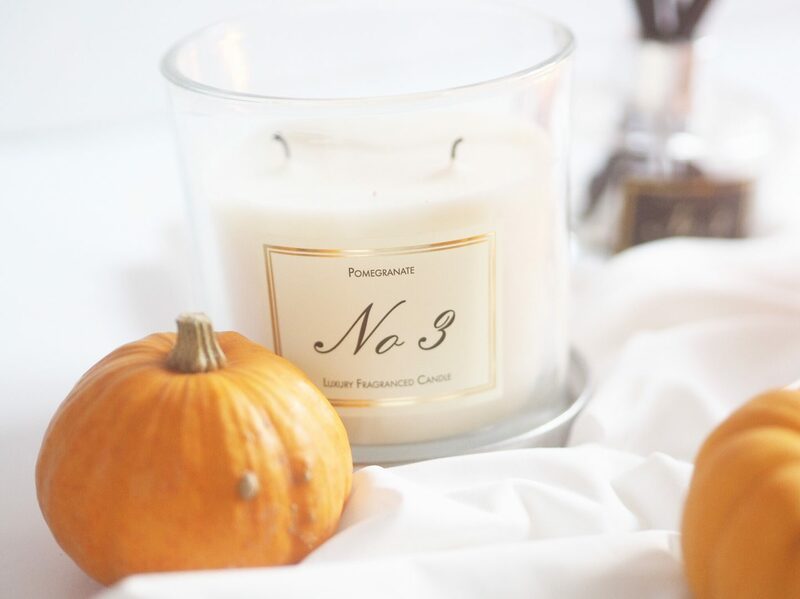 Aw I really want to love these, but I wrote about the dangers of this kind of scented candle in my cosy Autumn post!! Have you considered beeswax for a healthier season! Love the pics though hun.